By compressing flight tasks, crews going to the International Space Station can make the trip in one-eighth the time. For astronauts, chasing down and docking with the International Space Station has been a tedious two-day process on Russia's Soyuz spacecraft. A new technique cuts this to only six hours. Following three unmanned, cargo-only test flights, the Expedition 35/36 crew is the first to try the technique. The Soyuz spacecraft can fly autonomously in orbit for only about four days total, so the faster rendezvous frees up more fuel, oxygen and other supplies for possible use in an emergency. Liftoff plus 9 minutes: Soyuz separates from booster rocket. 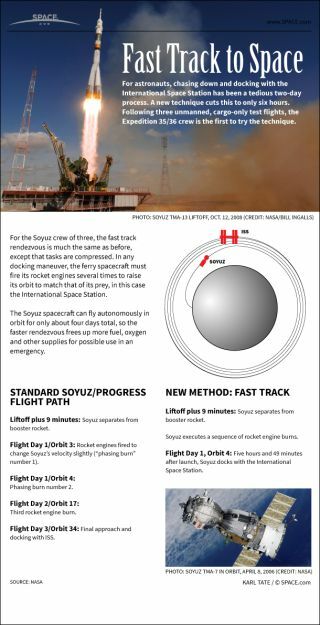 Flight Day 1/Orbit 3: Rocket engines fired to change Soyuz’s velocity slightly (“phasing burn” number 1). Flight Day 1/Orbit 4: Phasing burn number 2. Flight Day 2/Orbit 17: Third rocket engine burn. Flight Day 3/Orbit 34: Final approach and docking with ISS. Soyuz executes a sequence of rocket engine burns. Flight Day 1, Orbit 4: Five hours and 49 minutes after launch, Soyuz docks with the International Space Station.